Any sizeable jetty is a magnet for people visiting a town and a kind of informal social centre for the locals. Our new jetty at Eaglehawk Neck is no exception. It’s not an old wooden one, (as many people would prefer), but is still a great place to stretch your legs, watch the boats come and go, learn of some secret places to see from the locals, try your luck with a line or just relax for a while. Photo: Arthur Orchard – jetty area and boat sheds, with Blowhole behind them, taken from across Pirates Bay. With the local fishing fleet and several charter operators working out of Pirates Bay, The Tasmanian Tuna Club on site, and four busy boat ramps right next to jetty, there is always some sort of activity going on so it’s well and truly worth checking out what’s happening at any time of day. 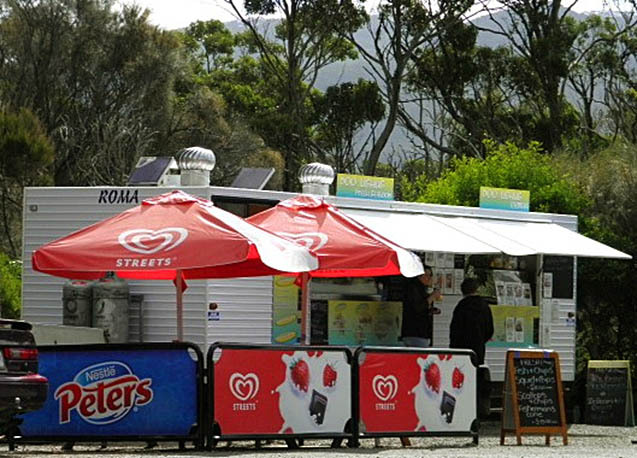 Photo: Arthur Orchard – The Doolishus food van at the Blowhole. There is plenty of parking, the famous ‘Doolishus’ food van is nearby (except in winter) and public toilets are close by.